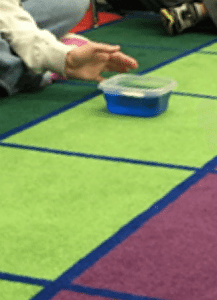 “In early childhood classrooms, science based lessons are something that are often done, but not as often explored by students,” shares Kristen Harvey, Pre-Kindergarten teacher at the Franklin. The Franklin Early Childhood Center, part of the Melrose Public Schools in Massachusetts, serves approximately 300 three and four year old students. This past fall, Franklin teachers were introduced to the Question Formulation Technique (QFT) as a way to begin project based learning (PBL) in science. In project based learning, a question leads students’ learning and final project. The teachers discussed using the QFT as a way to help students generate their own questions and guide student learning, investigations, and projects. To prepare to facilitate the QFT with their students, teachers experienced the QFT themselves using the school’s new playground as a Question Focus (QFocus). They generated questions as they explored the playground. They were charged to go back and try to use the strategy in their classroom. Below are descriptions of some of the ways question-asking was integrated into their units. The QFT protocol was also used more flexibly by the early childhood educators. It had to be modified to meet the needs of three and four year olds. 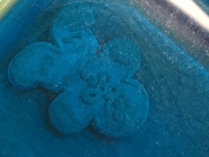 A QFocus was always used. Students generated questions that were then written by the teachers. Questions sometimes were generated over several days as new ideas were thought of by the students. Teachers led discussions on which questions they could investigate further referring back and adding to the questions generated as the unit unfolded. 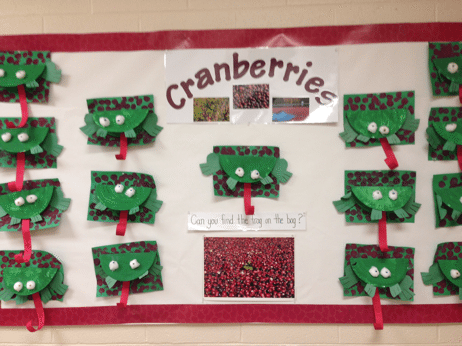 Kristen Harvey, Pre-Kindergarten teacher describes her use of questioning to begin a fall unit on cranberries. As in past years, the fall theme of my pre-K class was cranberries. 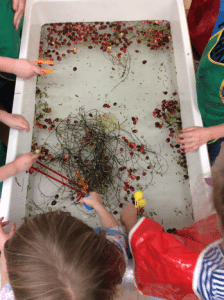 This year instead of explaining how cranberries were harvested, I decided to show my students the harvesting process and then find out what they wanted to know about it. As a class, we explored actual cranberry vines. 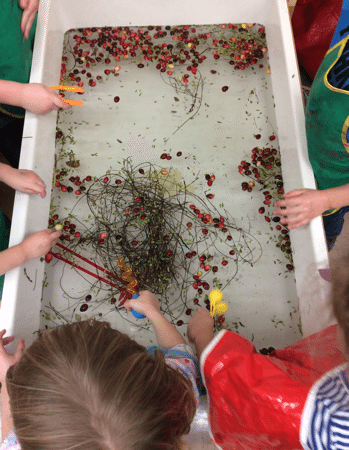 We saw that when pulled from their vines, cranberries submerged in water floated to the surface. We then did the QFT using the experience as our Question Focus. The questions my 4 and 5 year olds came up with were beyond what I thought their comprehension level was. They had so many fabulous inquiries. When students are invested in their learning they experience a greater sense of ownership. Students had many great ideas about where to find their answers. 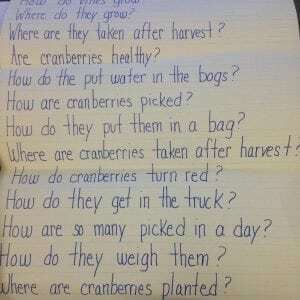 We looked at video clips, read books and asked cranberry growers our questions. I even had parents of one student take him to a cranberry farm and talk to the farmer! By the end, many of my students were teaching their parents about cranberries. This was a wonderful learning lesson for me as a teacher. Student ownership is what learning is all about. I look forward to many more lessons from my students! Andrea Serino, multi-age preschool teacher, describes how she used students’ questions to start her gingerbread holiday unit. 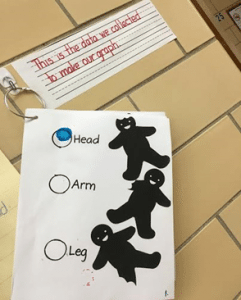 In our gingerbread holiday unit, students read gingerbread stories in which a gingerbr ead man rides on a fox’s back when crossing a river to stay out of the water. We then did an adapted QFT with gingerbread people as the Question Focus. 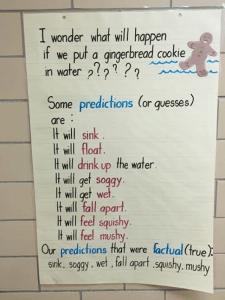 The group decided to further explore one of their questions: What happens if a gingerbread cookie is put into the water? We did an experiment to arrive at the answer. We found that our gingerbread cookie sank in the water. He did not float. Then the class explored a further question: What would happen if they added soap to the water to make it bubbly? 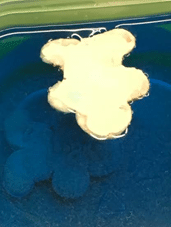 They discovered: The gingerbread cookie was able to float for about 10 seconds. He then sank to the bottom and became soggy, mushy, and fell apart. 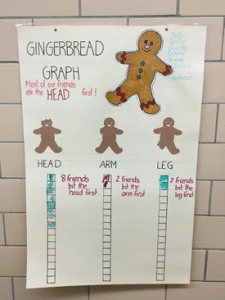 As a class, we collected data to make a gingerbread graph. The class was given a gingerbread cookie and asked to take a bite and then put the cookie down in front of them. We then recorded the data and graphed which part of the gingerbread cookie was eaten first. Lisa Bernadino, Pre-Kindergarten teacher describes how she used questioning to begin her unit this fall on pumpkins. This fall, our class began a unit on pumpkins. Students were shown two carved pumpkins, one that would stay in the classroom and the other that would be put outside. We did a modified QFT using the pumpkins as a Question Focus. Students generated lots of questions and then focused on one question of study: What do you think will happen to these pumpkins? Children recorded changes in the pumpkins three times over several days by drawing pictures. After each recording we sat as a group and looked at the initial questions to see if we had answered any of them or made changes to original thoughts. At first, I had hoped that the class would consider whether the pumpkin outside could generate another. Their questions and predictions did not focus on this possibility until our pumpkin decomposed and we read Pumpkin Jack. In this story, a decomposing pumpkin grows new pumpkins from its seeds. After, the children realized that maybe the pumpkin outside could possibly do the same. They noted that much of what they had recorded and questioned had happened in the story, but that they had never thought of the seeds generating new plants. Kristen Sasso, multi-age preschool teacher, describes use of question generation in her dramatic play. lodge as we began our unit on the winter season. As students played in dramatic play, students were asked to generate their questions about winter using a modified QFT. 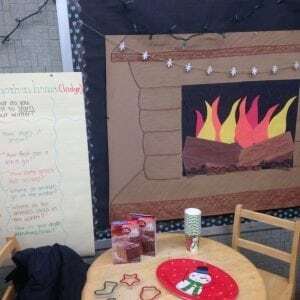 The children were encouraged to imagine sitting sipping pretend cocoa and eating pretend gingerbread cookies as they allowed questions to percolate. After a couple weeks of trying questioning with their students, teachers gathered again to share their successes and challenges in having students generate their own questions. Teachers shared that the process of asking students to generate their own questions did in fact sustain student interest in the topic and unit. Using a hands-on Question Focus helped students generate more questions. Asking students to think about the five senses also helped students to generate more questions. Teacher were excited to find that three year olds were able to engage in the question-asking process as well. Notably, they had more difficulty than older students when asked to generate questions. Teachers discussed that they may not know what a question is. Several strategies were identified to overcome this. Modeling during play time and in small groups helped get the questioning started. The stem “I wonder” sometimes helped get ideas flowing. Additionally teachers took advantage of story-time to draw students’ attention to punctuation marks and language intonation to help students further discern the difference between a question and a statement. As described earlier, the QFT was modified and used in a way to meet the developmental needs of students. Primarily, questions were generated over several days in a playful manner in both whole and small group settings within the classrooms. Teachers facilitated the discussion of which questions were investigated by the group. Making question-asking playful and a natural part of the classroom worked well. In the end, we learned three and four year olds are capable of great questions and driving their own learning. Lisa Bernadino, Pre-Kindergarten Teacher, Kristen Harvey, Pre-Kindergarten Teacher, Andrea Serino, Multi-age Teacher, and Kristen Sasso Multi-age Teacher all teach at the Franklin Early Childhood Center in Melrose, MA. Donna Rosso is the Director of the Franklin Early Childhood Center. Margaret Adams is Assistant Superintendent for Teaching and Learning for Melrose Public Schools. This blog was made possible through the support of a grant from the Sir John Templeton Foundation. The opinions expressed in this publication are those of the author(s) and do not necessarily reflect the views of the John Templeton Foundation.